Published Jul 22, 2014 by Addison-Wesley Professional. Part of the LiveLessons series. An essential primer on Software Defined Networking (SDN). Lesson 1: What Is SDN? Terry Slattery, CCIE #1026, is a senior network engineer with decades of experience in the internetworking industry. Terry is a Principal Consultant at Chesapeake Netcraftsmen, an advanced network consultancy that specializes in high-profile and challenging network consulting jobs. Terry is consulting in network core switching and routing and network management. He is the founder of Netcordia, inventor of NetMRI, and co-inventor on two patents, and he has been a successful technology innovator in networking during the past 20 years. He has a long history of network consulting and design work, including some of the first Cisco consulting and training on the east coast. As a consultant to Cisco, he led the development of the current Cisco IOS command line interface. Prior to Netcordia, Terry founded Chesapeake Computer Consultants, which became a Cisco premier training and consulting partner. At Chesapeake, he co-invented and patented the v-LAB system to provide hands-on access to real hardware for the hands-on component of internetwork training classes. Terry co-authored the successful Advanced IP Routing in Cisco Networks, is the second CCIE (1026) awarded, and is a sought-after industry speaker and advisor. 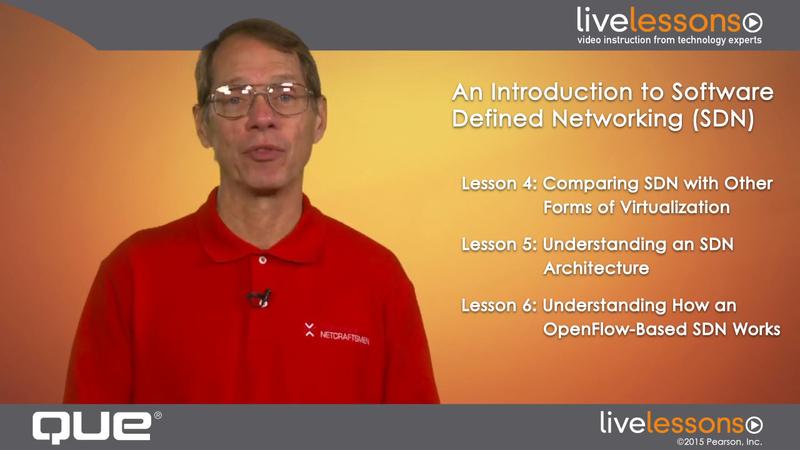 The target audiences for this video course are those who want an introduction to SDN. In Lesson 1, we become conversant in SDN. We start by taking a look at its history and how it’s evolved and then detail why you might use it. Lesson 2 describes what it means for a network to be a Software-Defined Network. It continues by defining “data plane” and “control plane.” We explore how you’ve most likely already been using a version of SDN in your work. SDN provides multiple benefits, as described in Lesson 3. You learn how traditional networking technologies have increased the complexity of networking while SDN offers the opportunity to simplify networking. Lesson 4 looks at compute, memory, and storage virtualization to provide a foundation for why network virtualization provided by SDN is valuable. In Lesson 5, you learn the architecture of an SDN and why separation of the control plane and the data plane is implemented. Lesson 6 describes how the Open-Flow version of SDN functions. The basic functions presented in this lesson provide the foundation for examining different types of SDNs. In Lesson 7, you learn about the standards that exist for SDN and the standards that are in development. SDN has some problems that need to be resolved for it to be an effective replacement for traditional networking technologies. Lesson 8 identifies some of these shortfalls and their impact. In Lesson 9, you learn how an SDN can interface with the rest of an organization’s network or with external networks. Lesson 10 describes the topologies that are effective for an SDN as well as monitoring and troubleshooting methodologies. Two examples of how an SDN improves network agility are provided. In Lesson 11, you learn how to get started with SDN. Included are links to documents and videos for learning more about SDN.